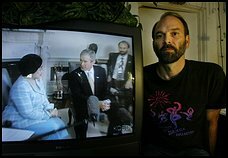 A series of small miracles led me to the White House, where I eventually served as interpreter for Presidents Bill Clinton and George W. Bush. I was amazed that it all happened pretty much without even trying. I later became a whistleblower as the result of this important work and even ended up on the front page of the Wall Street Journal. Before my resignation due to excessive secrecy in 2004, I had interpreted for President Bill Clinton, President George W. Bush, Vice Presidents Gore and Cheney, Secretaries of State Albright and Powell, and numerous other presidents and officials from many countries. Whenever present in high-level meetings, I did my best to open to divine guidance, and to send out lots of love, support, and wishes for what's best to all present.